Magical private dining overlooking the lane and garden with your own private entrance from Ashton Lane. Cosy group dining in the heart of the bar with a beautiful roaring stove and atmospheric lighting. Garden parties under the stars, whatever the weather - enjoy private dining and celebrations in our beautiful conservatory - you can even host your very own private Fondue Night! 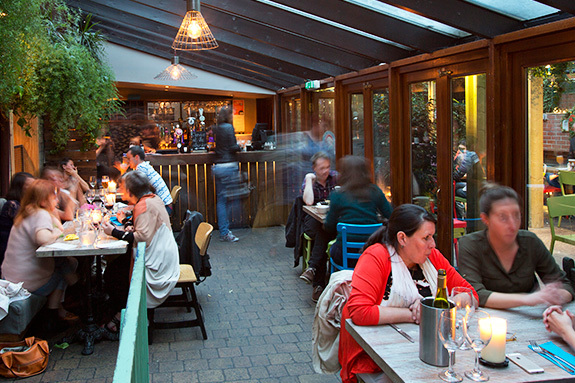 Fully heated and covered, our patio is perfect for al fresco dining, private BBQ's (complete with your very own chef!) or outdoor drinks parties all year round. Nestled in the trees and overlooking the garden, our beautiful Solarium is a fairy tale setting for private drinks parties and get togethers. Cosy nights by the fire – hire our fire pit for private drinks and marshmallow parties and enjoy the perfect view of our magical garden. Hire brel for your next party! Which space are you interested in? UP Mezzanine Conservatory Heated Patio The Solarium Not sure yet!